It’s only natural that most companies look to their national government’s competent authorities as the source of their trade control compliance obligations. In the export control space, of course, underpinning much of the relevant research and dialogue between nations is the work of the multilateral export control organisations: the Wassenaar Arrangement, Nuclear Suppliers Group (NSG), Australia Group, Zangger Committee and Missile Technology Control Regime (MTCR). For companies whose activities are largely outside of the nuclear/biochemical realm, the Wassenaar Arrangement is arguably the best known and closely observed of those. But the control lists of the other organisations – at a time of heightened proliferation fears – are also important to follow. As international beasts whose outcomes are subject to negotiations between their members, the ‘multilaterals’ are not immune to politics. Indeed, they are platforms upon which geopolitical and technological developments intersect with global security. Complex stuff. We are delighted that Diego Cándano Laris, delegate at the Wassenaar Arrangement and the Nuclear Suppliers Group, where he chairs the Consultative Group, will be on hand to explain some of the key developments in the multilateral community over the past year – and importantly – their bearing on export control compliance and counter-proliferation. Eighteen months into the Donald Trump presidency, and, in some respects, sanctions are more prominent in the terrain of global business than ever before. President Trump’s decision to pull the US out of the JCPOA has caused an international split, with the EU and other signatories poised to resist any change. Just what this means for US companies and their overseas subsidiaries is unfolding by the day – and needs to be watched and undersood. But against Russia, Venezuela and, of course, North Korea, the US administration remains determined to show it is no soft touch: CAATSA – the Countering America’s Adversaries Through Sanctions Act – is as bold as its name. And as at writing time, North Korea, the focus of concerted international convergence, is drawing the attention of increasing number of businesses as the ‘net tightens’. In this presentation, Jane Shvets and Konstantin Bureiko will give a tour de horizon of UN, EU and US sanctions, emphasising those areas less well understood by compliance personnel. They will describe the general direction of travel of key agencies such as OFAC, grey areas, and underlaps between the respective regimes of different jurisdictions. This is a must-attend presentation given by two lawyers who advise businesses and financial institutions at the highest level, both on practical, day-to-day matters, and for strategic planning. While certainly to be applauded for their intent, ‘human rights-based’ trade controls pose challenges – and perhaps a new approach – for companies looking to stay compliant. Besides placing upon them not only new due diligence demands and screening considerations, certain policies have been criticised as adopting a more subjective approach that requires the company make its own value judgements about the desirability of business with certain jurisdictions and parties. Moreover, the adoption of national sanctions on the basis of anti-terrorist legislation, such as the recently announced asset freezes by the UK, brings into the discussion the interplay between human rights and national security considerations in shaping trade policy. It also raises additional questions of compliance for companies and of the effectiveness of such responses. We’re delighted that Lourdes Catrain of the law firm Hogan Lovells will walk us through this new landscape – and the appropriate business response. These are all amongst the questions that Lothar Harings and Marian Niestedt of leading German law firm GVW Graf von Westphalen will be addressing in this presentation – issues, of course, which have a bearing not only for German companies and investors in Germany, but for all other EU manufacturers and exporters of controlled goods. We’re delighted that Miller & Chevalier’s Barbara Linney will be with us to fine-tune our understanding of the notion and nature of secondary sanctions, their application – and why, in 2018, they’re riding high on the compliance agenda. Her colleague Saskia Zandieh will explore the steadily increasing deployment of US secondary sanctions as instruments of the human rights and anti-corruption movements in addition to their traditional role as foreign policy tools and how these new objectives impact sanctions compliance. With ever-increasing frequency, intangible technology presents greater export control and related security challenges. What may have once appeared to be of concern only to tech companies, is today a mainstream challenge. Not only is the technology complex, but so is the law. For companies for whom technology is the lifeblood, it is essential to interpret and comply with a rulebook striving to stay on top of its brief. Luiz will be outlining recent developments in these areas and their potential to impact on the technology sector – one of the world’s most vibrant economic drivers. Restricted party screening – or ‘knowing your party’ – lies at the heart of trade control compliance. Software tools are essential to sifting through multiple restricted party lists. But in many respects, screening, and other forms of due diligence, remain more art than science if companies are to make intelligent decisions about third parties – and the activities it is appropriate to engage in with them. How to meet and juggle the respective requirements of the OFAC ‘50%’ rule and its EU equivalent? What are the implications of CAATSA for those doing business with Russia? And how to avoid taking a ‘tick-list’ approach to screening which is commercially detrimental – and jeopardises business relationships? These are the kinds of questions which Jim Huish, Director of Compliance for the EU and Russia at ZTE, and Magnus Nordeus, Group Head of Trade Compliance at global telecoms company Ericsson, will be addressing – alongside any that you may have – in the course of a panel discussion on restricted party screening and due diligence. Sweden’s Saab AB is one of the world’s best-known aerospace and defence companies employing around 15,000 people, and with a truly global footprint. Amongst its formidable product line is the Gripen fighter system. But Saab also produces submarines and warships, communications systems, civil security products and subsystems – it’s a huge inventory of sophisticated products, parts and technology. So what’s the secret to managing the formidable trade compliance obligations? We’re delighted that Bjorn Uggla, who has been Vice President and Head of Export Compliance at Saab AB since September 2014 will be at the Forum to tell us. Prior to joining Saab AB, Bjorn held positions within the Swedish Defence Materiel Administration (FMV) – with the last four years as Counselor for defence procurement at the Swedish Embassy in Washington. His observations on addressing complex compliance needs at a time of geopolitical change will be food for thought – for companies in both the defence AND the civil sector.. The need to balance multijurisdictional trade control regimes has become a commonplace for global companies; that’s not to say that it is straightforward. Different countries and blocs have their own foreign policies and national interests, reflected in control lists, designations and sometimes blocking statutes. 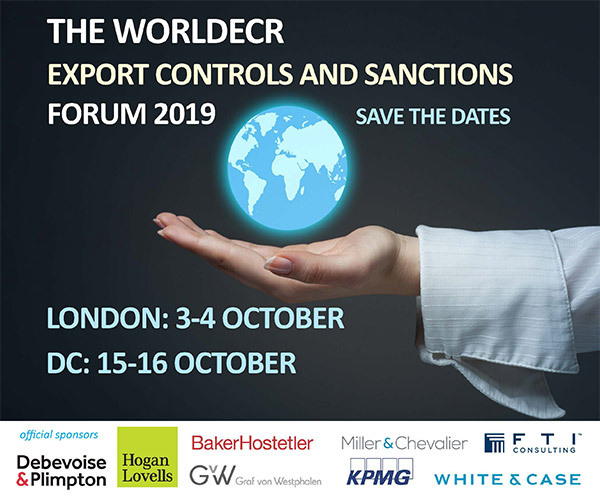 Warren Bayliss, Global Head of Defence Export Controls at Rolls-Royce, and Alexander Groba, Head of Customs, Export Control & Foreign Trade at MTU Aero Engines are well-placed to discuss strategies for managing – and complying with – multiple export control regimes. We look forward to their insights. On account of the complexity, ubiquity and critical necessity of its contribution to every part of our economic and social fabric, the ICT faces a huge range of regulatory challenges in the trade control space – many of which impact not only on the sector itself but on those using ICT-related services or products. Richard will also be looking at what may be on the horizon – including the possibility of controls on digital forensics – at future policy trends which may be lying in wait! The Committee on Foreign Investment in the United States (CFIUS) has the power to unwind your deal, even after it has been executed. Think about that for a moment: All the time, effort, and, of course, legal fees, that go into an investment, merger, or acquisition – lost because of an obscure but powerful US regulatory body. Whether it is an investment or a strategic acquisition, foreign direct investment in the United States has come under intense scrutiny recently. In his presentation, Sheppard Mullin’s Reid Whitten will walk you through how the Committee operates, then discuss what you can do to plan and prepare to successfully navigate the narrow straits of a CFIUS review to the safe harbour of a successful transaction – also touching on the recent push to modernise CFIUS, and the impact that may have on, amongst other things, technology transfer with US companies. It’s little surprise that an increasing number of companies are now considering blockchain technology (also known as distributed and decentralised ledger technology, or ‘DLT’) to improve their business processes. Blockchain technology uses cryptography, to ensure that transactions remain private and secure – and there is significant potential for safeguarding the integrity of business processes to store data in a manner that cannot be changed, stolen or otherwise compromised by malicious software or third parties. But as regulators step up their efforts to get to grips with implications of blockchain, what kind of impact do or will blockchain-enabled business processes have on the role of compliance managers and officers? Having played an instrumental role in numerous blockchain projects, Dr. Andreas Furrer, professor of private, comparative, international private and European law of the University of Lucerne and partner at the Swiss firm MME, based in Zurich, is well placed to give the low-down on blockchain and its potential to change the way you view conventional business processes – and related compliance obligations. Ibtissem Lassoued – Gulf of understanding? The United Arab Emirates – which includes the major international business centres of Dubai and Abu Dhabi – is a figurative stone’s throw from Iran, and compliance with the Iran sanctions regimes (both UN and the unilateral regimes of the United States, European Union and others) has always been a practical concern for commercial and financial institutions working out of those places. How has the Joint Comprehensive Plan of Action impacted on regional compliance strategies? Given Ibtissem’s long-standing practice and hands-on experience of sanctions, financial crime and AML issues in the region, delegates are assured a unique take on what remains a key area of concern for compliance officers in industry, finance and across the service sector. BREXIT may mean BREXIT, but what does it actually mean for UK sanctions policy once it’s happened? The Sanctions and Money Laundering Bill – introduced in 2017 – is intended to go some way toward addressing that question. As Hogan Lovells counsel Jamie Rogers will explain, the proposed legislation will, when enacted, enable the UK government to impose sanctions in compliance with United Nations Security Council resolutions and other international (including EU obligations). But it does more than smooth the path for a close working relationship with the remaining 27 members of the European Union. The Bill would also create a new licensing environment and broaden the scope for imposing unilateral sanctions – a prospect which, in these interesting times may provide for potential departures from Brussels. Sophie Delhoulle and Philp Ankel – Information overload? Make data tools your friend! We’re delighted that Sophie Delhoulle, Director of Legal Services, Trade Compliance, EMEA at Accenture, and Philip Ankel, Partner at Controlling & Finance Audit (‘CFA’) at Siemens, will be on hand to talk with us about their companies’ journeys as they get to grips with the ‘informatics revolution’ and the discoveries made therein. Jane Shvets and Konstantin Bureiko of Debevoise & Plimpton will be explaining the 50% rule and its EU equivalent, and outlining in practical terms best practice in ascertaining beneficial ownership under both regimes. Increasingly, companies, financial and other services are including proliferation finance due diligence in their compliance activities. In this presentation, Emil Dall will outline recent developments and guidelines in the proliferation finance realm – also showcasing hot-off-the-press research relating to proliferation finance in the insurance industry (with relevance and parallels to other business sectors). Emil, formerly a risk analyst for a major international insurer operating out of Lloyds of London, is a Research Fellow in the Proliferation and Nuclear Policy Programme at RUSI, where he focuses on sanctions, finance and illicit nuclear and missile proliferation, particularly North Korea.